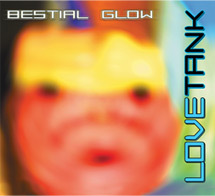 Love Tank are a San Francisco based jazz band featuring John Law on Drums and Percussion, Brendan Rush Dance on Horns, Whistles and spoken words, Brandon Butrick on bass and guitar. This CD features special guests T. Reed on synths and effects and Nejdet Ulu. It is pretty laid back but also spacey at times but the main focus is on the horn playing for sure.. The opening track, Brown Cow, really showcases everyone in this band. The band totally experiment though with strange backing drones, bizarre spoken words.. This is no straightup jazz. Ages Gone is more laid back and prominently features the flute. Cold Future features programmed sounding drums at the beginning and some strange sounds and bells before the spoken words come into play. A really great and playful band, with a lot of surprises to be found… Great stuff..